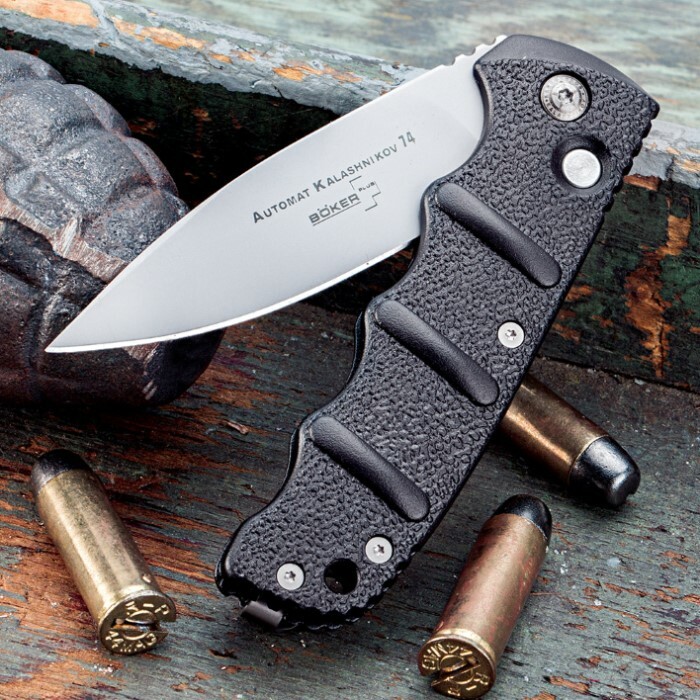 This knife from Boker Magnum has as its namesake Mikhail Kalashnikov, creator of the infamous AK-47 assault rifle. This tactical knife is designed in Germany by Dietmar Pohl, ensuring that its quality lives up to its proud German heritage. The 3.25 in. stainless steel blade is powder coated for glare reduction with a sharp edge and piercing point. Open the blade with a push of the button and quick flick of the wrist. The T-6 6061 aircraft-grade aluminum handle provides reduced weight and a firm grip. I have bought 4 of these, and I found that each worked differently, but they can be adjusted with the torx screw by the button. that will stop them from not coming completely open or flopping back closed. I plan on buying more for friends for camping and fishing. 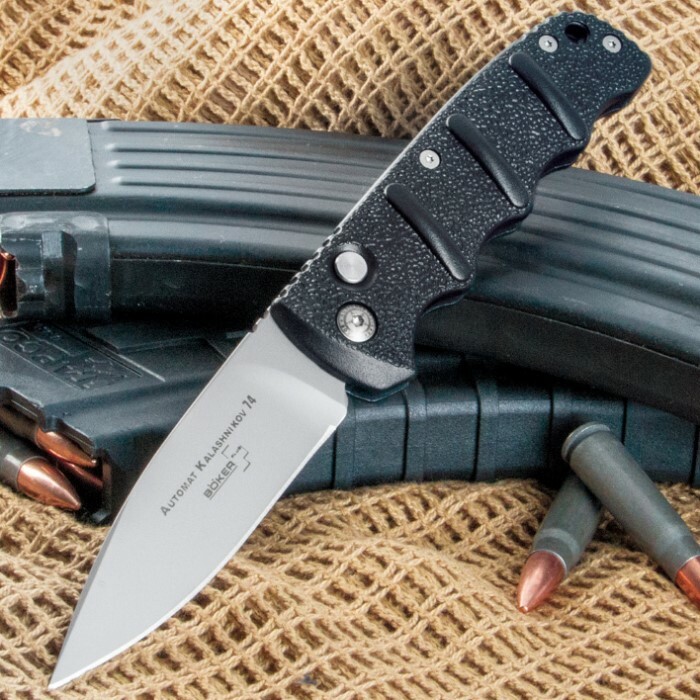 The Boker Kalashnikov push button tactical knife is indeed a high quality pocket knife. You know it right away when you feel it in your hand. It is all solid metal. The blade is solid and does not wobble. In its open position the blade is firm. The edge came sharp as I tested it on paper. The complaints about its push-button assist are unwarranted. You have to push the button firmly all the way in with the edge of the thumbnail and then give a hard swing/shake with the wrist and yes, the blade swings out and locks. You just have to practice a few times. This is not a switchblade and was never advertised as one. I am so impressed by this folding lock blade knife that I am seriously considering purchasing a second. I hate this knife. It's not assisted open. Worse part is that the button sticks and interfers with opening the blade. Do yourself a favor, DO NOT buy it. I should have read reviews, I thought it was assisted opening. With the button and picture, I was thrown off. It is a quality knife and I'm keeping it, but for my hiking pack. I'll keep looking for an assisted opening knife for everyday carry. The button is more of a safety to keep it locked, it does nothing to help it open. This is a good knife and I enjoy mine. Here is what I like; coated blade, handle gives a good grip, and the clip is substantial. The push button opening is ok but the fast action flick often results in the knife fully opening but not locking. Too much flick and the blade bounces back from the lock position. The Boker Kalashnakov is a quality knife. The blade is of good steel and the handle seems durable. However, don't get it confused with the Boker Kalashnakov that is identical in appearence and is automatic. This one isn't even assisted opening. You have to master the flip for fast opening or use your free hand. I bought this knife, because of it's ease of opening. I'm 74 and my fingers don't work so well any more. It was so good and stayed sharp I bought another. 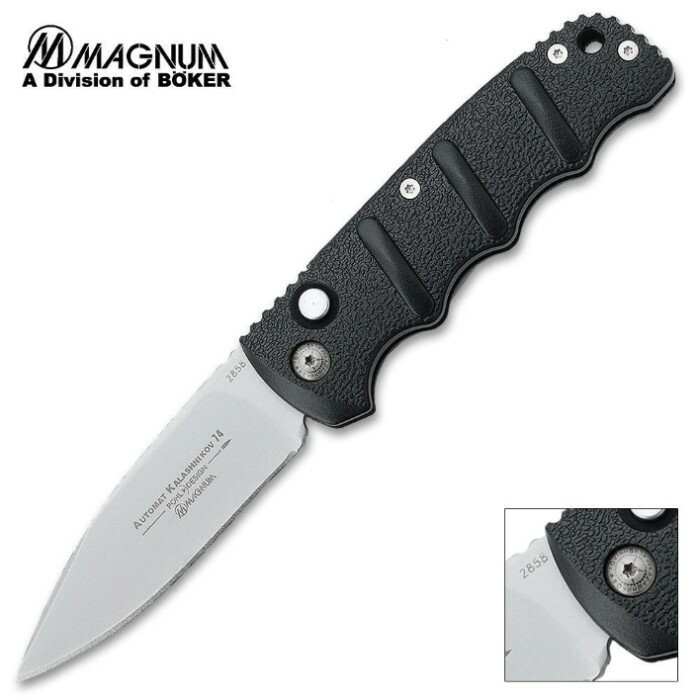 this is the toughest most funtional very quick one handed opening blade for the money out there.I am a heavy equipment repairman and I use mine every day.Can last forever if cleaned and sharpened regularly.I love this blade.I am ordering a new one now just because its on sale and I can.I have used the one I have over 2 years.